The Zeiss Batis 25mm f/2 features a 9-blade circular aperture diaphragm and an f/2 – f/22 aperture range. Construction is an all-metal casting, which is both dust- and moisture-resistant, and weighing in at 335 grams with a 92mm barrel length, it’s a nicely-balanced lens mounted on the Sony A7R. Optical construction utilizes 10 elements in 8 groups, offers a minimum focus distance of just 20cm, and the front element features a 67mm filter thread which doesn’t rotate during focus. The addition of autofocus will widen the the appeal of the Zeiss lens, but for the manual focus enthusiast, the Zeiss Batis 25mm f/2 features a wide and well-weighted focus ring for precise adjustment. The wide-angle 25mm focal length offers an 82-degree field of view that’s well-suited for landscape, architecture, and street photography on the Sony A7. We had the pleasure of running the Carl Zeiss Batis 25m f/2 through our industry-standard tests and are delighted to reveal the verified results. With a DxOMark score of 39 points tested on the Sony A7R, the Zeiss Batis 25mm f/2 is the highest-scoring wide-angle lens we’ve tested to date. With a sharpness score of 22 P-Mpix, this lens offers homogenous resolution at all aperture settings except f/2, and outstanding sharpness over 70% at apertures between f/2 – f/11, with resolution dropping to just under 60% at f/22. Distortion of 0.5% is consistent with the top ten wide-angle primes we’ve tested, with only minor barrel distortion evident. Light transmission of 2.0 stops is also the best for tested wide-angle primes, ensuring a bright display and plenty of light for the autofocus system. Chromatic aberration of just 6um signals indicates that fringing is well-controlled in most situations. Wide-angle lenses tend to suffer from vignetting (where the full intensity of light doesn’t reach into the corners of the frame). This is true on the Zeiss Batis 25mm f/2, which records a vignetting score of –2.5Ev. This is marginally worse than much of the wide-angle competition, and at the widest apertures of f/2 and f/2.8, fairly heavy vignetting occurs. Close down between f/4 – f/22, however, and things improve. 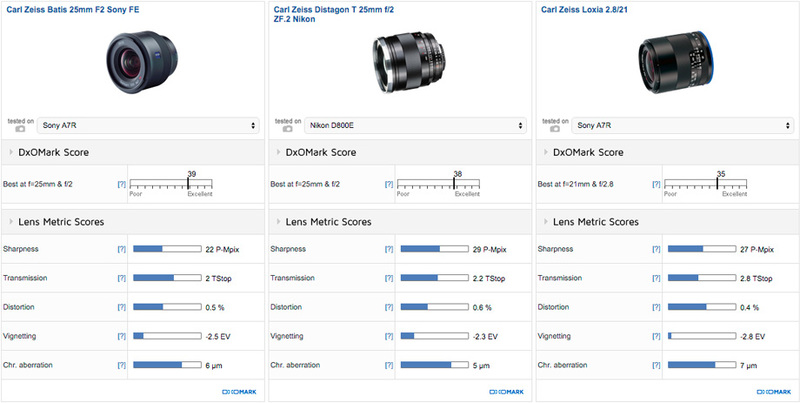 Let’s further analyze the lens metrics of the $1299 Zeiss Batis 25mm f/2 against the high-scoring $1699 Zeiss Distagon 25mm f/2 and the $1499 Zeiss Loxia 2.8/21 wide-angle primes. 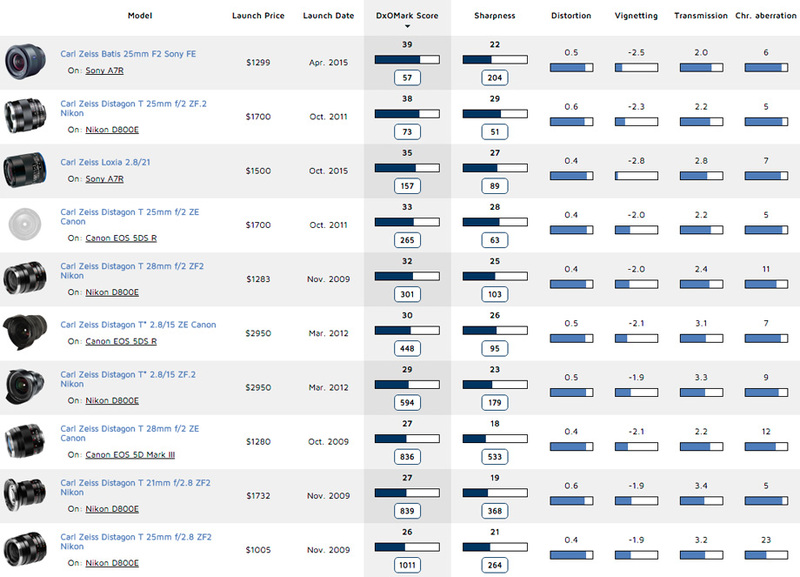 Head-to-head against the highest-scoring wide-angle primes in our database, the Zeiss Batis 25mm f/2 wins overall with 39 points, but is slightly down for overall sharpness. Tested on either the 36Mp Sony A7R or 36Mp Nikon D800E, the manual-focus Zeiss Distagon T 25mm f/2 achieves the best sharpness of 29 P-MPix on the Nikon D800E, with the wider-angle Zeiss Loxia 2.8/21 coming in second with 27 P-Mpix. Although resolution on the Zeiss Batis is pretty strong at f/2, it’s not quite as uniform as the Zeiss Distagon T 25mm f/2 at the same setting, nor the Zeiss Loxia at f/2.8. The Zeiss Batis 25mm f/2 is at its sharpest at f/4 and f/5.6, and although resolution at f/8 is comparable between the Zeiss Batis 25mm f/2 and Zeiss Loxia 2.8/21, again, the Zeiss Distagon T is just a little bit stronger. There’s not much in it, to be fair — all three are excellent, but the Zeiss Distagon T 25mm f/2 is just that bit sharper on the Nikon D800E. It’s a similar story at f/22, where although resolution drops on all three optics, the Zeiss Distagon T 25mm f/2 is stronger and more homogenous than the Batis and Loxia competition at this minimum-aperture setting. Vignetting correction at the widest aperture settings will be required on all three lenses, but as you can see from the field maps, corner shading on the Zeiss Batis 25mm f/2 extends a little further into the frame compared to its rivals. For chromatic aberration, the Zeiss Batis 25mm f/2 also displays a little more corner fringing at the smaller apertures between f/5.6 – f/22 than the Zeiss Distagon T 25mm and Zeiss Loxia 2.8/21. It’s far from a big issue, however, as the fringing is restricted to the very far corners of the frame and is going to have only a limited impacted on real-world results. Sony A7 mirrorless cameras, and particularly the super-high-resolution A7R series, demand top-quality, fast-aperture prime lenses to get the best from their sensors. Meeting this need in their new Batis lineup, Zeiss has taken its renowned excellence for build and optical quality and improved functionality with the addition of both autofocus and the new innovative OLED barrel display. Available at a more affordable $1299 price point than many Zeiss lenses, the new Zeiss Batis 25mm f/2 will be a desirable lens for many Sony FE landscape, architecture, and street photographers looking for an optically-strong wide-angle solution. If you need a wider field of view, the Zeiss Loxia 2.8/21 offers improved sharpness of 27 P-Mpix compared to 22 P-Mpix for the Zeiss Batis 25mm f/2. The Batis is still outstandingly sharp, however, and offers a faster maximum aperture with better light transmission, as well as marginally better results for vignetting and chromatic aberration than the Loxia 2.8/21. 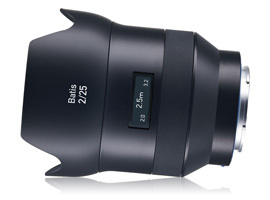 All in all, the Zeiss Batis 25mm f/2 is a champion wide lens and that’s why it currently sits at the top in our database.